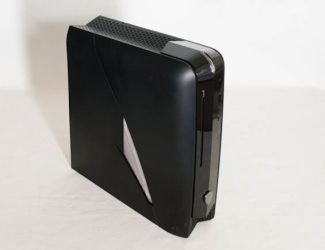 "The X51 is basically the size of an Xbox 360, but the insides are pure PC: Alienware employs a Mini-ITX motherboard, desktop-level Sandy Bridge Intel processors, and a full-sized double-slot graphics card (rotated ninety degrees and connected via a riser card to the PCIe 2.1 x16 slot)." The gaming industry has seen a lot of changes over the past few years. While gaming consoles have traditionally dominated the market, the rise of casual games on the iPhone and Android have gained a lot of attention lately. PC gaming, though, is like that that kid you see at the school dance, standing in a corner, all alone, trying to look inconspicuous. He may have a lot to offer, and really is a great person, but no one wants to even talk to him because he does not quite fit in with the rest of the crowd. Despite all the love that other gaming platforms get, there is still a great market for PC gaming and the success of Steam suggests that it is not going to die anytime soon. The Alienware X51 looks like a good stab at helping to create more interest in the platform. The biggest problem I see with the PC platform is its complexity. Performance varies widely, depending on what hardware you have, and with most games being 3D, a lot of computers that use integrated graphics find the experience less than stellar. Distribution services like Steam go a long way to simplifying the distribution chain, but until games can offer a much more stable platform like that which you see with a console, or a mobile device, I am certain that many people will remain put off by the whole thing.